May. 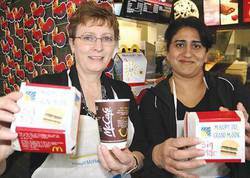 4, 2013 9:00 a.m.
Colleen Zimmerman, left, administrative co-ordinator of the Wetaskiwin McDonalds, along with Maddie Sharma, co-owner of the Wetaskiwin McDonalds, want to remind everyone that May 8 is McHappy Day at all McDonalds locations across North America. There will be a number of activities taking place at the Wetaskiwin location, including a silent auction and live musical entertainment. Its one of the busiest days of the year for McDonald’s restaurants across North America and this year, the Wetaskiwin location wants your help to make it even bigger and better. This May 8 will mark the 20th anniversary of McHappy Days. On this day, $1 from every Big Mac sandwich, Happy Meal, and McCafe beverages sold will go towards the Wetaskiwin Special Olympics and the Ronald McDonald House of Northern Alberta. To help celebrate the special day, a number of special guests from the community, including Mayor Bill Elliot, emergency service personnel and volunteers will help assist staff at the restaurant in an effort to help raise additional funds for the two important charities. “Everyone always says the same thing; they never knew how much you needed to know to work here,” joked Colleen Zimmerman, administrative co-ordinator for the Wetaskiwin McDonald’s restaurant, in regards to how the many volunteers feel about working at the restaurant. Leading up to McHappy Day, red paper Ronald McDonald shoes are being sold by the Special Olympic volunteers and at the restaurant. Throughout the day at the Wetaskiwin restaurant, special McHappy Day merchandise and balloons will be sold to patrons, bake sale items will also be available until all the yummy treats are completely sold out. There will also be a silent auction held from 9 a.m. to 7 p.m. Some of the items that will be up for bid include tickets to the Canadian Country Music Awards, tickets for a dinner and show at the River Cree Resort and Casino, several gift baskets, golf passes, tools and a brand new tablet. During the dinner rush, entertainment at the restaurant will be provided for hungry customers by Wetaskiwin group Pants and Animals. “It’s great that we could get them to come out and put on a show in the restaurant,” Zimmerman explained. Zimmerman said it isn’t uncommon to see individuals or families coming back to the restaurant twice or even three times during McHappy Day. “They’ll get their morning coffee, then come for lunch and come back again for supper,” she said in an interview with the Pipestone Flyer. “It’s the busiest day across all McDonalds,” she added. First celebrated in Canada, McHappy Day is now a worldwide event that unites McDonald’s restaurants globally in support of children’s charities in local communities. Since its inception in 1977, McHappy Day has raised nearly $38 million for Canadian children.